It was during a mid-2005 Congressional Black Caucus (CBC) meeting on Capitol Hill when award-winning journalist Askia Muhammad captured one of the most significant photos of his career. Muhammad had doggedly covered then Chicago Sen. Barack Obama since he “first laid eyes on him” at the 2004 Democratic National Convention. Now, here was the Senator in a warm conversation with constituent and fellow Chicagoan Minister Louis Farrakhan. As leader of the Nation of Islam, Farrakhan is another star in Black America, but one whose name is synonymous with controversy. Wasting no time, Muhammad snapped the news photo. But moments later, he faced a dilemma. Obama had already become the darling of national Democratic politics. And the scent of a presidential run was strong. Muhammad had not even left the scene when he received a call and the photo was being summoned by a member of the Congressional Black Caucus. Muhammad ultimately surrendered the disk to Minister Farrakhan’s chief of staff. And it remained one of America’s best hidden secrets for the next 12 years. 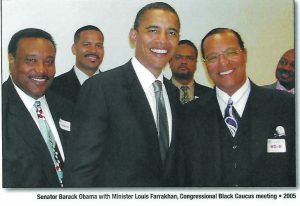 For the first time, more than a decade later, the glowing photograph of now former President Barack Obama and Minister Louis Farrakhan has been published in a book by Muhammad to be released Jan. 31 – “The Autobiography of Charles 67X.” Muhammad and some political observers still believe that if that photo had been released, it could have drawn enough fire – even from some of Obama’s supporters looking for excuses – to dent his chances of becoming President. He has agreement in high places. “I do believe that it would have had a very, very negative affect in that given moment as far as the candidacy of candidate Obama at that time,” says Dr. Shayla Nunnally, president of the National Conference of Black Political Scientists. Her opinion was based largely on the “negative stereotypes about Muslim Americans about Black people and about their allegiance to the United States,” which have often been twisted and used to fit bigoted agendas – especially after the terrorist attacks of Sept. 11, 2001. Nunnally, a professor of political science who also teaches in the Africana Studies Institute at the University of Connecticut, specializes in public opinion, political behavior, race and politics. Obama, who is a Christian, has constantly been the target of bigoted attacks, Nunnally pointed out. When a woman called him an Arab during a public forum, even his re-election opponent Sen. John McCain retrieved the microphone and corrected her, saying, “No ma’am. He’s a decent family man.” Nunnally also recalled how former Secretary of State Colin Powell once weighed in against negative stereotyping of Muslims saying, “He’s a Christian…But the really right answer is, what if he is” a Muslim? Also, pictured in the photo are Minister Farrakhan’s son-in-law, Leonard Farrakhan Muhammad; His son and security chief, Mustapha Farrakhan; Minister Farrakhan’s son Joshua Farrakhan; and the Rev. Willie Wilson, executive producer of the program for Farrakhan’s Million Man March in 1995 and a chairman of the 20th anniversary. In an interview, Wilson says he doesn’t recall the photo and didn’t know he was in it. But hearing the description, he also was certain it could have hurt Obama’s campaign. The book tells of other notables who knew about the photograph and never divulged it. In addition to narratives of pivotal moments of his life, the autobiography is also a book of Muhammad’s poetry. Columnist and political observer A. Peter Bailey, anticipating the book release, says he believes the photo would have created controversy for Obama, but could not have caused him to lose the election or his re-election because of the groundswell of Black voter support for him.